Over the past 5-years, my wife (Laura) and I have been living in a mountain wilderness among free-roaming wild horses studying and filming them. In that time we have observed and documented a significant amount of important and new information on the behavioral ecology of American native species wild horses, including their evolutionary symbiotic mutualisms within a forested landscape, particularly as it applies to maintaining grass and brush fuels on the landscape, which can devolve catastrophic wildfire back to the normal wildfire we expect on the landscape. There are very few, if any, advocates that have that kind of holistic overview and experience, for which there is no substitute. Unlike many of the administrators running the donation-supported wild horse and burro non-profit advocacy groups, including American Wild Horse Campaign, I bring a multidiscipline background to aid in the longstanding plight of American wild horses. Among many professional vocations and a holistic overview of natural history and science, I have academic training and experience as a scientist and inventor combined with empirical experience ranching and managing forests (including logging and fire ecology) in the rural and wilderness areas of northern California and Oregon. There are now numerous supporters of the Plan known affectionately as ‘Wild Horse Fire Brigade’. 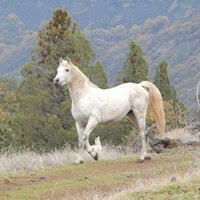 This Plan seeks to redisposition wild horses away from being in conflict with livestock enterprises and languishing in government holding pens and deploy them into wildfire fuel abatement roles in remote wilderness forest areas that will never be suited to livestock due to the presence of numerous apex predators and very difficult access. This ‘difficult access’ is what makes fire suppression in such areas so very expensive, typically requiring aerial suppression costing about $1-million/hour in many cases. And moreover, when firefighters are deployed into these areas, they are at higher risk than in other areas, many times resulting in injuries and loss of life. For these and many other reasons, numerous politicians, officials, firefighters, radio and TV talks show hosts, ranchers, foresters and wild horse and burro advocates have joined in supporting Wild Horse Fire Brigade. Carla Bowers, a wild horse advocate for nine years is part of that massive support base, and had recently reached out to the executive director of the American Wild Horse Campaign thinking they would also join the effort. However, as we read in Suzanne Roy’s email reply, instead of seeing this Plan as the saving grace for wild horses that it is, and a way to end much of the fighting between them and numerous agencies and ranchers, Ms. Roy preferred to put up barriers to the Plan. Within Ms. Roy’s email below, I offer my perspectives on the criticism she posited to Carla Bowers, who sent me her email for my comment. Please see the italicized [bracketed] observations and opinion I have inserted within the body of Ms. Roy’s email to Ms. Bowers (note; Ms. Bowers’ initial email to Ms. Roy is at the bottom of this article). Subject: Re: New development from AG Becerra's Special Assistant Attorney General Ellie Blume - when can we talk by phone? Carla, this proposal [Wild Horse Fire Brigade] is fraught with legal, scientific and environmental obstacles and has no support from the California environmental community. Without such support, legislation would be DOA. William Simpson: [First, let me say that all of the statements provided by Ms. Roy to Ms. Bowers were unsupported conjectures. Furthermore, for someone whose organization is usually embroiled in a lawsuit in some manner or another at any given time and brags about litigation, claiming that a possible “legal” obstacle is a show stopper is disingenuous. And this new study titled; ‘Experimental rewilding enhances grassland functional composition and pollinator habitat use’, and published in the British Ecological Society, points to the benefits of re-wilding wild horses onto the landscape. Thirdly, as to her allegations that there is no environmental support for the Plan, I am a bit shocked to hear a supposed wild horse advocate make such a statement given the irrefutable science, natural history and paleontological evidence that proves wild horses are native to North America and have evolved as symbionts in most North American ecosystems where their fossil remains are also present. Added to which, the Wild Horse Fire Brigade Plan has just recently over the past year been brought to the attention of environmental scientists, who are seeking to keep hydrocarbon compounds sequestered to help mitigate climate change, which is aided by the reduction of catastrophic wildfire. What Ms. Roy seems to fail to understand is that in 2017, just the wildfires in Oregon put 3.3-million tons of carbon monoxide (‘CO’) gas (along with other greenhouse gases) into our atmosphere. And the 3.3-million tons of CO gas produced was more than all the on-road tailpipe exhaust in the same year! Miss Roy: Additionally, there is no way that we'd support the concept of a county using police power to put wild horses on federal lands. This would set a precedent that is much more likely to be used to expand cattle and sheep grazing on federal lands under the guise of "fire abatement," which is what most of these rural counties want but is not a scientifically sound approach to fire risk reduction. The last thing we want is more livestock grazing on federal lands. Miss Roy: Finally, using the transfer authority to strip wild horses of federal protection and put them under the ownership of rural counties is potentially dangerous. Miss Roy: As you and I have discussed and you and Ellie have discussed, this is not a plan that AWHC supports. Not sure how to be more clear about it. William Simpson [So in conclusion, as evident by the response from Ms. Roy, she sees the world from a narrow myopic view and is only interested in what ‘she’ feels is relevant, seemingly in conflict with law, science and common sense. Of course she carries on the financing of pursuing her own perspectives with money that is obtained via solicited donations from numerous third parties. Is this really helping America’s wild horses and burros? Therefore, I am offering this rebuttal in the interest of full disclosure in the consideration of these very important issues. This paradigm shift model Plan can potentially save the ca. 50K native American wild horses in holding and the thousands being rounded up off of the range currently from an imminent slaughter fate and can save millions to billions of dollars and forests, infrastructure and lives too. Isn’t that what we all want? Capt. William E. Simpson II - USMM Ret. Hi, Suzanne - Hope you've been able to enjoy the holidays with family & friends to some degree. I must admit it's hard for me to enjoy much of anything with the plight of our wild horses weighing heavy on my mind & heart. Momentum & support is building for rewilding our remote forest wilderness areas with our "excess" (I hate that word!) wild horses via the Natural Wildfire Abatement and Forest Protection Plan aka Wild Horse Fire Brigade (WHFB), especially in OR where Bill Simpson has many more contacts, from their Governor Kate Brown, Senator Alan DeBoer, Jackson & Klamath County commissioners, fire & law enforcement officials, newspapers & radio programs covering the subject, etc. Bill is confident that the large-scale pilot studies he has proposed for the Kalmiopsis Wilderness & Cascade-Siskiyou National Monument in S. OR will be implemented in 2019. I've been trying to get some traction here in CA & emailed key WHFB info to AG Becerra's office & requested a meeting with him. We were successful in getting a conference call with Special Assistant Attorney General Ellie Blume recently. She was extremely supportive & interested in the Plan & said that AG Becerra would write a letter to the CA legislature endorsing the Plan if we found a legislative champion to bring a Bill forward in support of implementing the Plan in CA to help prevent some of the catastrophic wildfire events that have been occurring & to concurrently save our at-risk-for-slaughter wild horses. She got that CA is severely depleted in megafauna (mainly deer & elk) which is causing the excessive 1-hour ground fuels growth to remain unabated which, in turn, is fueling our super hot megafires. She understood that Six Rivers Wilderness Area in NW CA would be an appropriate Pilot Study area for starters. Thanks to your work & since Todd Gloria is already willing to champion a Bill on the wild horses' behalf, I would like to reach out to him to discuss adding the rewilding of our wild horses to remote wilderness areas in CA for wildfire prevention to his Bill. I would like to work together with you & AWHC to this end. Can we talk further by phone about this? I think we have to bring to the table an economic value of each wild horse deployed for fuel abatement for the state legislature and ultimately the appropriate counties in CA to buy into the Plan. If we don't talk money, I don't think we'll get anywhere with these people. The state/counties won't be making money per se, but they will be potentially saving millions of dollars on fire suppression costs by air in remote areas where the horses are deployed. Bill has determined that a wild horse's fuel abatement value equates to $72K over its lifetime compared to more traditional fuel abatement techniques (prescribed burns, which cause even more toxic smoke; weed-wacking; mechanical treatments; etc), plus using wild horses is totally natural & environmentally friendly. "There is no dispute that a local government can ordinarily exercise its police powers to mitigate fire danger within its territorial boundaries. But a federal regulation promulgated by the Department of Agriculture requires permission of the Forest Service before anyone can “[c]ut or otherwise damag[e] any timber, tree, or other forest product” in a national forest. 36 C.F.R. § 261.6 (a) [(2016)]." I would consider 2019 a Happy New Year if we can get many of our wild horses back to being wild & free with their families in the wilderness, where there is no livestock grazing & where there is still predation in a more natural ecosystem environment, where survival of the fittest & natural selection would be allowed to play out as the Creator intended. That would give my heart some bit of peace. Look forward to talking with you soon about this. Can we set a phone date/time this coming week?